Villa Annabelle is a new built house located in the village Farini, distant only 1,5 km from Visnjan and 9,5 km from Porec and the beaches. The house was built in 2014 and is furnished with simple furniture. 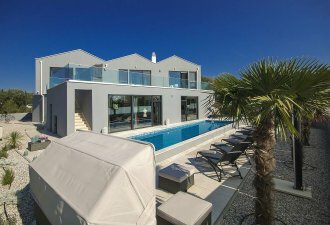 On its enclosed property of 1000 sqm Villa Annabelle offers to its guests the following outdoor facilities - a 24 sqm large swimming pool, covered terrace with sitting furniture, summer kitchen with barbecue and sitting set and two parking spaces. The holiday home is for 6 persons and has a total living area of 90 sqm on one floor. It consists of an air-conditioned living room with exit to the terrace facing the swimming pool, equipped kitchen with a dining table, three double bedrooms of which two with double beds and one with bunk beds, and two shower/toilets.